Design thinking: What is it and why do I care about it? Design thinking is a framework for finding ideal solutions to complex problems, through observation, empathy and experimentation centered around humans. You might think that this is all rather fluffy and without real content, but I'm here to show you otherwise. 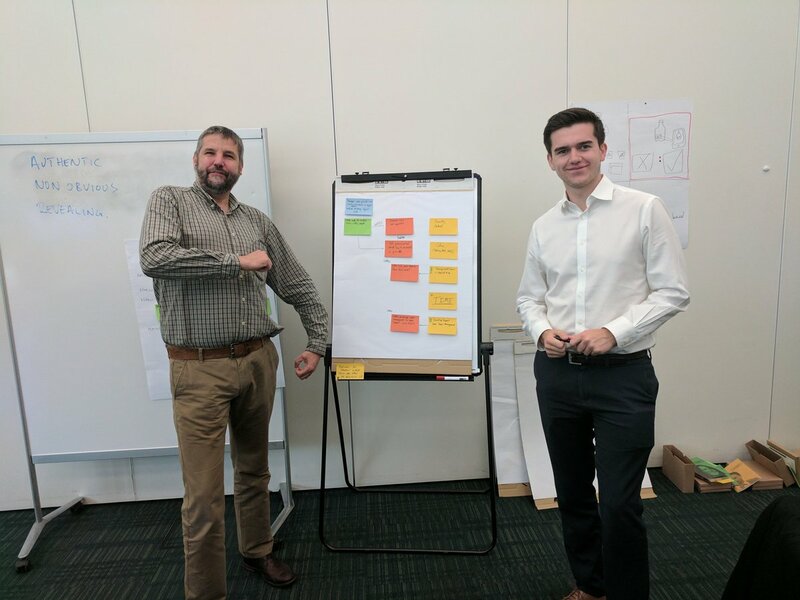 The following post is a collection of my thoughts following a Capgemini design thinking workshop run by Treehouse Innovation and is part of a wider initiative within Capgemini to promote design thinking across the business. What do we aim to get out of the Design Thinking framework? Design thinking always aims to find the most desirable solution, questions about feasibility and viability are left until the end of the process. The black dot is where we aim to get through design thinking, then we move into the realm of desirable, feasible and viable. These three phases form the double diamond design thinking methodology. There are many other methodologies, however they are all relatively similar. A fundamental concept of design thinking is the "converge-diverge" thought process. Design thinking teams should by nature be a diverse group, with many different disciplines. This is because it will give a greater variety of perceived and observed problems, as well as possible solutions. Converging is working together to come to a common understanding whilst diverging is work undertaken on your own and then taken back to the group. As you can see in the diagram above, the two diamonds represent the rough converge-diverge pattern, by phase of the process. In the Inspire phase, we do three things: Define the challenge, generate observations and distill them to insights. Defining the challenge can be quite difficult, you have to be careful in so many ways to create an effective solution. A good challenge statement will convey the issue you are trying to solve without baking a solution into the statement itself and without being explicitly measurable. Observation is the most important step in this phase because this is where you will be interacting with the people who should benefit from your solution. Three tools that we can use to gain observations are: Desktop Research, Field Observations and Interviews. Note: We must be very careful not to project our thoughts onto the observations, only comment on what you have actually observed and been told. Observations should be uncoloured by our own bias and specialist knowledge. Desktop Research is simply research done from your desk. Looking up stuff on the internet, reading books and journals. Desktop Research is usually the first port of call when preparing for interviews and field research because it is quick and easy, it gives you almost instant access to a number of resources which will help you to phrase your questions for further research. Desktop Research allows you to look into what people are doing in your competitors and other industries quickly, it should not be exhaustive or particularly deep. Desktop Research should inspire your decisions and preparation for further research. In field observations it's important to leave all preconceptions at the door! Assume a beginners mindset and be genuinely curious. Take lots of pictures, both of the people at work and the environment they work in, keep your eyes open for shortcuts and workarounds. Why are things done a certain way, how do people circumvent the 'norm'? Fly on the wall: Go and observe people where they live, work, shop and play. Think like a detective, take pictures and note down anything that piques your curiosity. Shadowing: Ask a members of the usergroup if you can shadow them. Request that they show and tell you how they go about their tasks. Role play: Physically put yourselves in the shoes of your usergroup and see what you can see from this perspective. Photo journals: Ask members of the usergroup if they can capture photos from their lives, related to your topic that they believe are important or interesting. If possible, ask them to annotate the reason for each photo or meet with them and allow them to walk you through the photos. Similar situations: Beyond these direct observations, you can observe similar situations in other industries and markets to see how they tackled the problem and if you can extrapolate that knowledge and relate it to your own challenge. Extreme users: These users have strong opinions whether positive or negative, getting extreme opinions will give you the inspiration to accurately frame the problem. e.g. amateurs and professionals, people who love or hate your topic. Context: Whenever possible you should be communicating with users in their relevant context, put yourself in the user's shoes and allow them to show you what they mean. Friends and family: Don't underestimate the power of your existing network, your personal connections and extended network often provide safe and easy information. Remote: It's not always possible to be face-to-face with your interviewee, get them on video chat and give them some questions in advance so that they can consider their answers. Share all of your observations with the team and then independently come up with insights. Observations are fact, pure and simple. However in gathering these observations we gain a certain level of understanding the "why" behind the observation, the motivation behind it. Insights should focus on what you believe the motivation behind observations are, they can be drawn from a single observation or many. An insight should not be how to fix something, or a possible solution. An insight should be an opening to this, a part of your challenge statement that you could focus on to solve the issue. I find it useful to start insights with "How Might We ...?" (A.K.A HMW), for instance: HMW make junior developers feel more comfortable sharing their thoughts and ideas? There is no baked solution in the insight and it is open-ended, allowing everyone to try and find their own solution to this. Empathy maps are a fantastic tool to accurately represent a user's experience and help you to understand their needs. You map out the information they're giving you against this map and it helps you to identify the user's values and true issues, articulated and hidden. It can also be helpful to notice if you haven't covered any areas when filling in the map. To get truly insightful information, you should always ask about best and worst experiences because these situations evoke emotion. Following this emotional response ask why they feel that way, find out what makes the user tick. A final question to really drill down and find what the root of the problem was, is to ask 'what' and 'how' it happened, the events that led to this situation. What led to this? How did it come to this? Share insights across the team and then group them, it's very likely a few of you will have come up with similar insights. Once you've grouped similar insights together, talk through each of the groups and maybe spend a few minutes talking about each insight in the group. Now everyone should pick their top 3 insights (using dot stickers is really helpful!) and see which of the insights come out on top. Note: It's important at this point to be able to get behind other peoples ideas and it will become more important as we move into the brainstorming. Now that we have our top insights, we can start to come up with ideas on how to action the insights. Build on other's ideas (especially the ones you don't like!). Be visual, a drawing is worth a thousand words. Go for quantity, just keep putting more ideas in. Following these rules makes for a very productive brainstorm. Making sure that everyone is heard and not judged leads to many varied ideas, which is exactly what we want. Lack of discussion helps to keep the brainstorm at breakneck pace: announce your idea, explain it and then get back to creating more ideas. Note: If you're struggling to come up with ideas, use a 'defibrillator'. Add a constraint that makes you approach the problem differently, you can get method cards that do just this from places such as IDEO and many others. Now that we have our insight and our HMW, why do we want to do this and what is stopping us? These two questions will help you further distill the information we have and lead us closer to a solution! You can summarise this by creating new HMW's. Asking 'Why?' helps us to abstract our HMW, to see it in the bigger picture, however asking 'What is stopping us?' helps us to narrow down our problem. Blue and green stickies are Insight and original HMW. Orange stickies are why we would like to achieve the HMW, yellow stickies are the things stopping us from achieving this. The bottom two orange stickies are new HMW's. Armed with our HMWs, plan small-scale cheap experiments to see if you are going down the right track. A good rule of thumb is to limit yourself to £100 spending power for the experiment. Experiments should be prove to some extent, a single piece of your functionality. For instance, let's say we've decided we want to set up "Uber for Bins". A good experiment would be to give one street access to a prototype, allow them to book a timeslot to have their bins emptied. All you need is a man and some kind of van, easily within budget and it will give you a good idea if people would or would not use the service. After performing your first experiment, you can start to prototype your solution based on your findings and just iterate this cycle with each new experiment. Once you have a suitably mature prototype, with a few good experiments and findings to support your choices then it's about time to start pitching. If you enjoyed reading about design thinking then I implore you to have a look at the Change by Design book, written by the CEO of IDEO. The design thinking process, and many of the tools in this article are a product of IDEO's relentless push to do better. This is a pretty rough-and-tumble version of design thinking, if you have questions about anything please drop a comment below. Likewise if you get to apply this, please drop a comment about your experience of how it went.